This photo was taken on June 15, 2016 at 3:06 PM. The location was in the back yard of my home. The "Take It!" came from watching this swath of an azalea bush stay in place long after all of the rest of the plant had dropped its floral splendor. I have no idea as to what the conditions are that have set this up to happen. The flowers are on the side of the bush that is the border to a walkway into the full back yard. 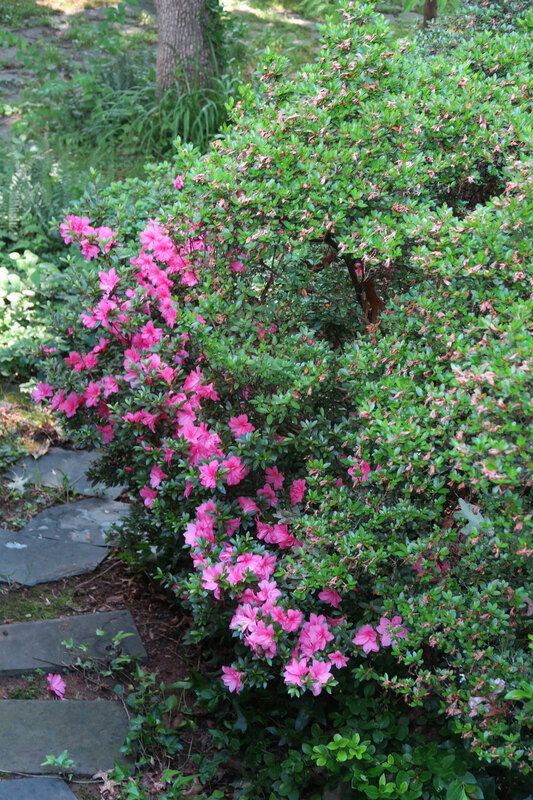 The blooms are low on the bush, which seems to suggest that they are able to escape major exposure to sunlight as opposite the walk is the bottom support structure for the deck. This under the deck place, offers shade as well. The After Take: While I had never noticed this in years gone by, it seems this year, I have been even more aware of my surroundings. The lingering of these blooms I view as a very special treat, and like so many that present themselves to me, this too is to be shared. Here is hoping you have had a pleasant spring and are launching into what will be a very good summer. So pretty, I just love this time of year, everything comes alive and is so vibrant. What a beautiful picture!! You must have a gorgeous backyard! It's def summer time! My wife and kids favorite time of year.